One percent of factory accidents involve forklift trucks, but the forklift accidents produce ten percent of the physical injuries. That’s an astonishing ratio, but not all that surprising given the nature of forklifts and the way they are utilized. Forklifts are dense, heavy-mass vehicles. When they collide with something – or someone – the results are devastating, even at low speeds. Kind of a terrifying list, don’t you think? The acceptable level for general warehouse operations where large items are handled require only 10 to 20 horizontal footcandles. Do you know the lighting levels in your facility? Find out, it may help you prevent an accident and increase productivity. Required lighting isn’t always the same in areas like “canyons” of rack rows as it is in the wide-open staging areas. Fixtures can be designed that provide sufficient illumination in various areas. If the light level in an area is below 2 lumens per square foot, mount auxiliary lights on your trucks. Improved lighting can have a dramatic, positive impact on productivity in general, but safety in specific. If your facility is too loud, not only does it mask the sound of an approaching forklift or of a pedestrian who has stopped to talk or pick items from racks, it can also degrade hearing over time. Utilize noise reducing equipment when possible. 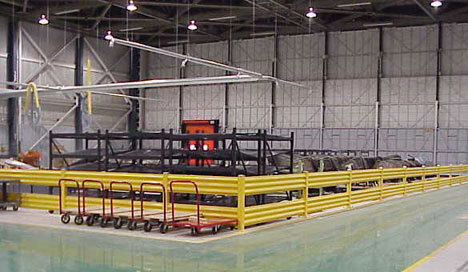 Specifying a quiet conveyor, for instance, can reduce noise levels throughout a facility. When possible, segment off unavoidably loud equipment from general operations with curtain walls or noise-deadening panels. In fact, sometimes they are made more vulnerable than necessary by the way a plant is set up. Create – and enforce – pedestrian crossing aisles and protective islands. When forklifts appear in unexpected places, the potential for accidents is multiplied. Enforcement may be more difficult than the establishment of these areas. Employees, both those who are on the ground and those who drive lift trucks, will resist restricted movement for safety’s sake when they are used to unrestricted access to every part of the facility. Traffic flow rules should be clear, visible, and routinely reinforced. Work cells should be shielded by metal guard rails. Mark pedestrian routes, and enforce them. Consider an automated pedestrian control gate such as AisleCop for control of blind, limited-vision, or heavy-traffic crossing points. These gates are controlled by automatic detection systems that will keep them closed if a forklift is in the vicinity. Are speed limits posted and enforced? Often, the pressure to produce pushes forklift speeds up. In some post-accident audits, forklifts are moving at average speeds of 8 miles per hour – too fast in the context of a warehouse operation. OSHA does not set a speed limit, though. Instead, it says that “Under all travel conditions the truck shall be operated at a speed that will permit it to be brought to a stop in a safe manner.” What you have to figure out is that speed point. Remember, a slow-looking forklift is extremely dangerous due to its mass. Momentum = mass x velocity (Weight x Speed x 1.5.) That means that a fully loaded forklift at five miles per hour is rather similar in impact to a full sized car at 20mph. Nor can forklift brakes stop the vehicle in a timely manner. In rack aisles, near order picking, or in the presence of foot traffic, forklifts need to be significantly slower than they are when not in the direct presence of pedestrian traffic. The suggested level for pedestrian areas is something you should determine on your own, but many safety experts recommend no more than 3 miles per hour. Your lift truck drivers, especially in a busy operation, will resist this. Make sure it sticks. Are your forklifts adequately equipped for safety? Does the horn work? Do you have automated backup beepers? Sufficient lights? Visibility mirrors? or blue warning lights? Are drivers using all of their safety resources? Are training programs and policies in place so that drivers know when to honk their horns, such as at blind spots? Insufficient floors or lots contribute to forklift accidents by making the vehicle less maneuverable and less stable. It’s easier to drop the load when the driving surface is inadequate. In warehouse applications, this can mostly be a non-issue as you are dealing with smooth, concrete floors. However, if your trucks are often used in the parking lot, on an asphalt surface, you may need to switch to different wheels, or have secondary safety precautions. Forklifts designed for use on smooth concrete may sink on asphalt or dirt surfaces, causing imbalances and dangerous loading & unloading situations. Are you using the right replacement parts? Utilizing aftermarket parts for your forklifts can be hazardous if you do not maintain the correct ballast weight. For instance, electric batteries, which weigh thousands of pounds, are often switched, and can alter the vehicle’s ballast weight by hundreds of pounds if not exactly the same. Any change in the ballast of your forklift can cause it to over-steer. OSHA forbids ballast alteration, but many operations will specify replacement parts that do exactly that. Are they wide enough to accommodate the forklift and a pedestrian? Do they cause errors because the driver is paying more attention than needed to his maneuvering between racks or walls? It is vital that aisles are adequately wide for the lift truck to operate. It’s doubly important if those same aisles are often walked by pedestrians. A driver who is trying not to hit racks, or who has to put his lift truck into tight spots, is one who is paying less attention to the people around him.